MACE Wages Spring Picket Offensive and Welcomes Back Benjamin Barnes! | Georgia Teachers Speak Out! ← MACE is Different than Other Georgia Teacher Unions! MACE Wages Spring Picket Offensive and Welcomes Back Benjamin Barnes! Editor’s Note: MACE’s Spring Picket Offensive finished in grand style, with Cynthia Dickerson of Clayton County’s Thurgood Marshall Elementary School receiving her picket on the last day of the school year. Benjamin (Ben) Barnes at Clayton’s Marshall Elementary School. Norreese Haynes in front of Gwinnett’s Norton Elementary School. MACE is in the full throe of its Springtime Picket Offensive. Last week, the MACE Picket Squad hunkered down to at Cobb County’s Floyd Middle School to picket Principal Teresa Hargrett. This picket was met with demonstrative signs of joy from the teacher. 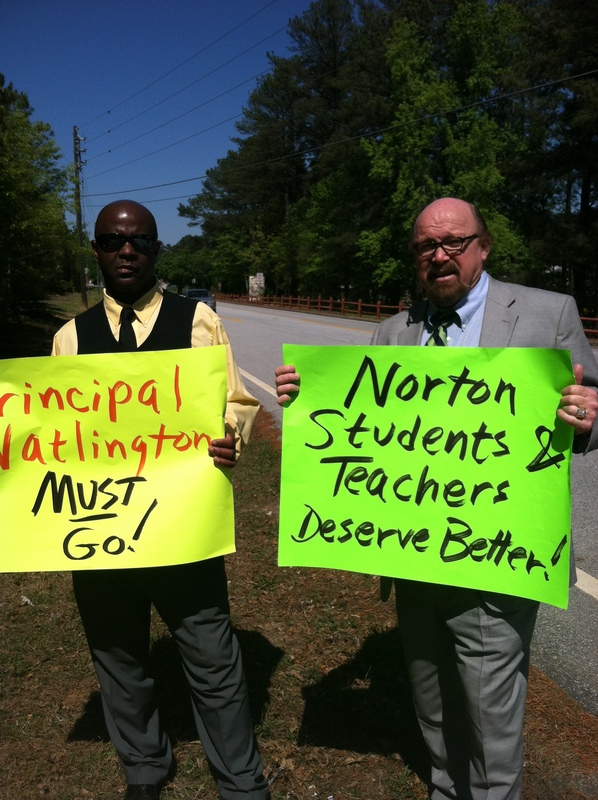 MACE also picketed at Gwinnett’s Norton Elementary School against the administration at that school. The principal is Terry Watlington. This picket was particular hot, both literally and figuratively. 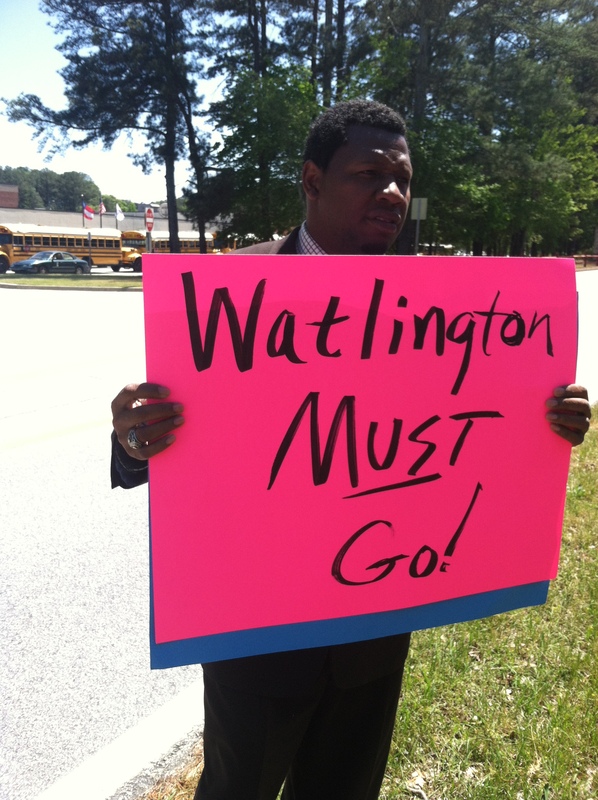 I am quite sure that Watlington and her administrative staff felt the heat…just like Hargrett must have felt it in Cobb County. The sun was bearing down on Darryl Plenty (L) and John Trotter (R) at Norton. This week, MACE will be making its presence known on the streets in DeKalb County. The Spring Picket Offensive is in full force. So far this year, MACE has picketed at Gwinnett’s Shiloh High School twice (Eric Parker) and once in the front of the Gwinnett Central Office against the same Eric Parker and Human Resources Director, Frances Davis. MACE has picketed the principal of Clayton’s Lee Street Elementary School twice in front of the school and once in front of the Central Office, causing the new Clayton superintendent, Luvenia Jackson to come out in front of the building to view the picket. MACE was on local network news on two occasions in two different pickets in Macon, Georgia against Romain Dallemand who went on and resigned in January. 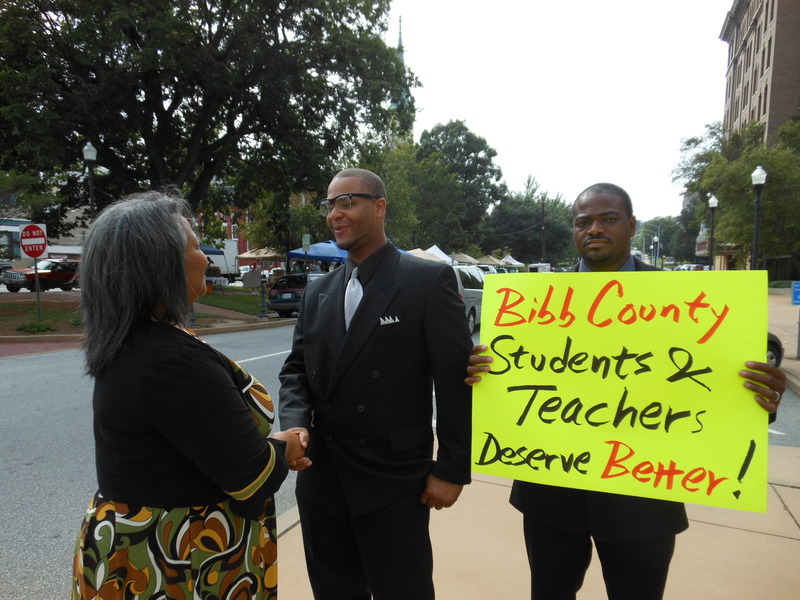 Benjamin (Ben) Barnes greeting a Bibb County School Board candidate on the street in Macon, Georgia in MACE’s first Dallemand picket there in September this year. Dallemand stepped down in January, less than a week after MACE’s second picket. 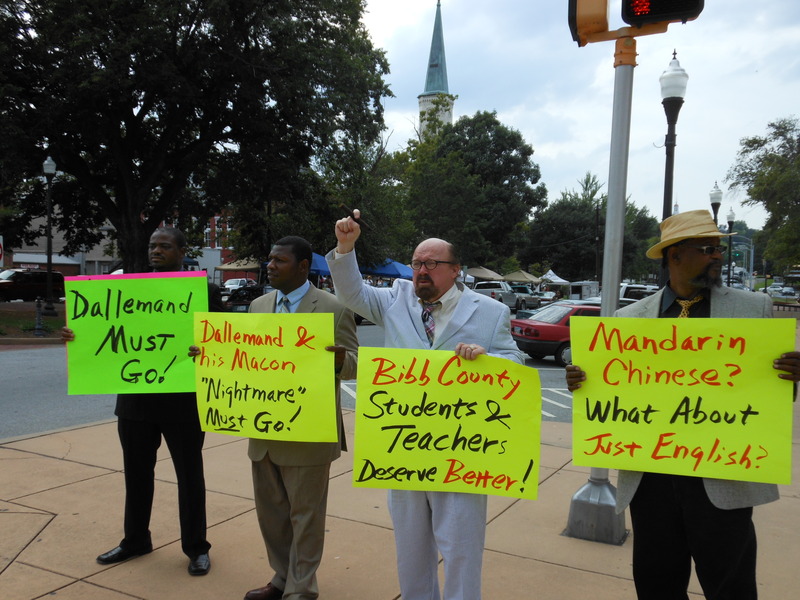 MACE has also picketed this year at Fulton’s Stonewall Tell Elementary, at the Fulton Central Office on Central Office, and at a Fulton County Board of Education meeting in North Fulton. The MACE Picket Squad also hit the streets in front of North Clayton High School and Gwinnett’s Bethesda Elementary School (Deborah Harris). “Dallemand Must Go!” He went. Benjamin (Ben) Barnes, one of the young turks and warriors on the MACE picket lines, has been absent lately due to his need to return to Louisiana to take care of his ailing grandfather. Mr. Barnes will be returning any day now. He has been a stalwart in the fight for teacher rights…and in particular for the rights of the MACE teachers! We welcome Ben back to the struggle, as we continue to wage spiritual war for the teachers. Remember this (and Ben knows it well): You cannot have good learning conditions until you first have good teaching conditions. J. B. 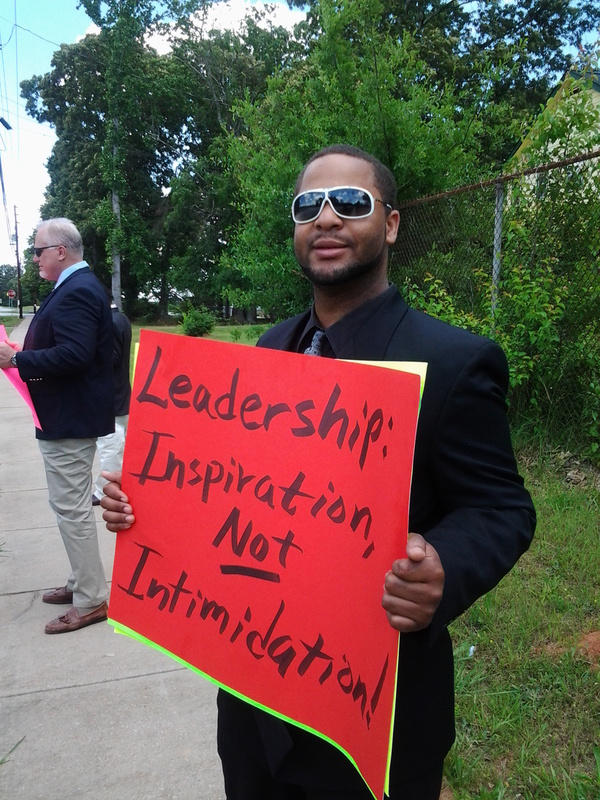 (Josh) Stanley at one of the many pickets against former superintendent in DeKalb, Crawford Lewis. This picket had been in a torrential rainstorm. After the storm calmed down, J. B. discusses the issues with constitutional law expert, Attorney Preston Haliburton (R), and Paul Broft (L). Shorty after this picket, Lewis was indicted for several felonies.